Happy Birthday USA!!! 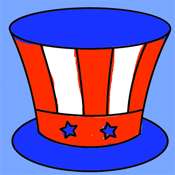 With Kid's Fingerpainting watch your kids draw their favorite Independence Day drawing. This app is ideal for kids of all ages. The app is like no other, your child can color you a picture of their favorite scene and personalize it with a frame and their autograph or message! This app is like having 2 apps in 1. After you finish coloring your favorite page you can use it in a slider puzzle. This app may help with developing your creative side as well as help you with thinking logically. Choose from nearly 20 different coloring pages to draw on. Includes a blank page to draw whatever they like. * Some images have color inside lines enabled. This app works on all iPad's supporting iOS 3.2 and greater.